In 1905, with rough sketches and a handful of tools, my Uncle Earl and his younger brother Floyd built their first canoe. They created a masterpiece. Sixteen years later they had a seven-year waiting list. The 17-foot classic was made of double-planked vertical grain cedar, trimmed with teak and mahogany. The Willits brothers were meticulous; each piece was carefully measured, shaped, and molded to fit perfectly into the next. Just under a thousand canoes were ever built. The last was finished March 2, 1963. When I invented my first game, Wykersham®, in 1980, I insisted the game be high in quality and made in America, featuring native hardwoods. The same old-fashioned craftsmanship that earned the Willits brothers their impeccable reputation, I forged into the heart and soul of my games. One afternoon in the spring of 2000, I picked up an old piece of hardwood leaning against my drafting table. The face of the board was deeply worn. Perfect! I attached a three-inch leather square in one corner, then, with a bold pen, laid out the playing area. 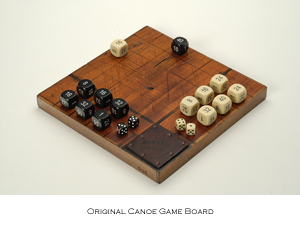 Twelve significantly oversize doubling cubes and a pair of standard dice were later added. In the fall of 2003, with game rules in hand, the next world-class strategy game was officially ready for launch. The game I affectionately call Canoe™. Canoe™ is my gift to you. May you find the game play brilliant. The competition stimulating. The board and cubes romantic.